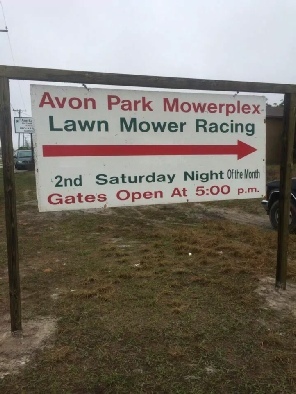 The Avon Park Mower-Plex was established in 2002. 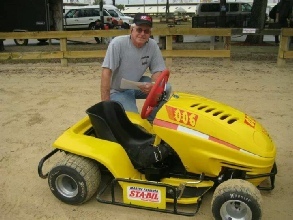 It came to fruition as the result of a dream by local lawn mower racing enthusiasts which resulted in the first for-purpose lawnracing facility in the United States. It began when residents Joe Gillians and Brian Benton approached the Avon Park City Council with the idea, saying they would clear a patch of ground on the westernmost end of the Avon Park Municipal Airport. At one time it had been a small rodeo arena, but over time had become an unofficial dump site. After securing the blessing of the city fathers, Gillians, Benton –and his wife Susan, then-mayor Tom Macklin and a number of others began work whacking down weeds and pulling all manner of junk from the site. As the vegetation and debris was stripped away infrastructure such as lights and sound was added and the Avon Park Mower-Plex was born. The races originally were run under the auspices of the North American Society of Grass Racers and Sod Slingers (NASGRASS) and a lawn mower drag strip was built in addition to the tri-oval which has become so familiar to local fans and drivers from all over the United States. Later, the Florida Lawnracing Association (FLA) was created in conjunction with the United States Lawn Mower Racing Association. After a short run under FLA, newly elected president, Wes Pyburn recreated the original governing body NASGRASS, to keep a strong and historic presence at the Mower-Plex. There is NO purse money in lawn mower racing. Racers compete for trophies, bragging rights, and the love of the sport. The facility is run by volunteers, with proceeds earned from sponsorships, competitor fees and other money-generating enterprises turned back into improvements at the track and trying to keep prices low. 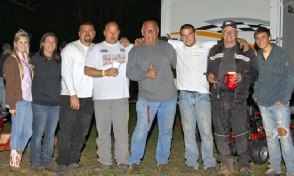 The racing season at the Mower-Plex runs on the second Saturday of each month from September through May.